Prasad Hettiarachi, born in 1975, previously lived and worked in the highly urban atmosphere of Rajagiriya in Colombo before moving to Bentota in early 2018. 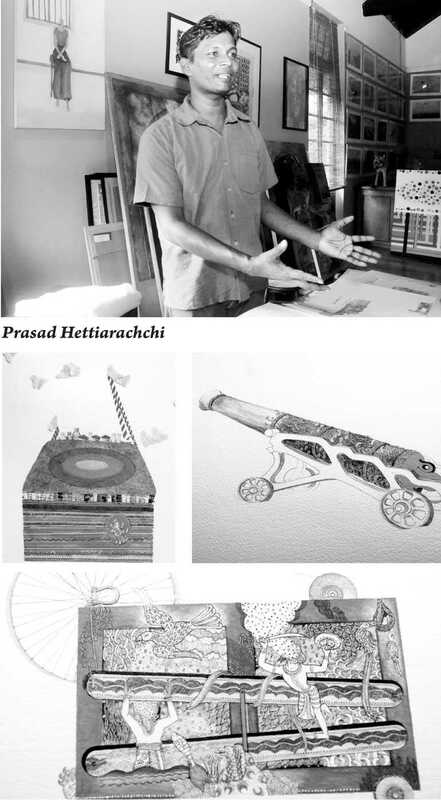 Since the early 2000s Prasad has played a role as an artist in an active leftist political party in Sri Lanka, doing calligraphy, posters, huge stage designs and works as a freelance artist. He has won numerous awards and participated in art workshops and projects since the early 90s and one of his works was selected for the 1994 Art Exhibition in France at the UNESCO Center by the Sri Lanka Cultural, Social and Educational Association of France. To date, however, Prasad does not possess a formal certificate in visual art. Having exhibited previously at the Theertha Red Dot Gallery, Theertha International Artists’ Collective, Exclusion’ is Prasad’s second solo show at the Barefoot Gallery, following his first ‘An Unbelievable Taste’ in 2015. With his characteristic detailed drawing, Prasad illustrates the unequal effect development has on different parts of society and how uneven development leaves groups of people feeling an excluded from society. ‘Exclusion’ will run from 10 May to 3 June at the Barefoot Gallery. Barefoot Gallery is open from 10 a.m. to 7 p.m. Monday to Saturday and 11 a.m. to 6 p.m. on Sunday.